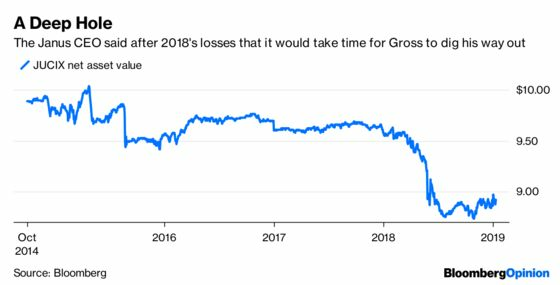 (Bloomberg Opinion) -- When Janus Henderson Group Plc hired Bill Gross in 2014, it probably expected to quickly become a force in the active fixed-income mutual fund world. After all, Gross was named “Manager of the Decade” by Morningstar Inc. in 2010 for steering the Total Return Fund at Pacific Investment Management Co., which at one point amassed almost $300 billion of assets. Instead, the Janus Henderson Global Unconstrained Bond Fund is looking more and more like a vanity project for Gross and potentially the last stop for the 74-year-old billionaire. Consider that as of Sept. 30, Gross and his family’s personal stake in Global Unconstrained was about $566 million, or 51.6 percent of the fund’s total assets. In dollar terms, he may have withdrawn or transferred about $150 million of shares compared with September 2017. But the hemorrhaging of assets that weren’t his own far outpaced that, giving him a majority stake. 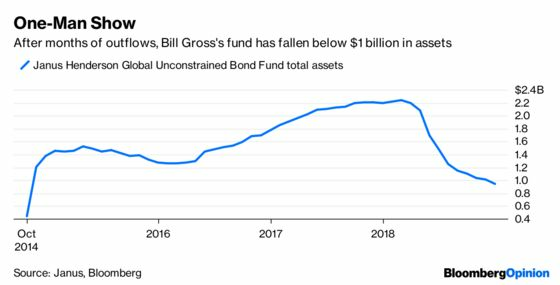 It’s unclear precisely what the ownership structure looks like now, but Gross’s portion is probably at least as high as a few months ago — the fund suffered an additional $60 million of redemptions in December, bringing its assets below $1 billion. As of Nov. 30, about 13 percent of the fund’s assets were invested in the stock (not bonds) of Express Scripts Holding Co., according to the Janus website. Data compiled by Bloomberg show that Gross began accumulating that position sometime in the third quarter. That was a tumultuous time for the shares, which no longer trade after the company was acquired by Cigna Corp. Carl Icahn famously opposed the acquisition at first, sending the stock tumbling on Aug. 1. Two weeks later, he dropped the fight, and antitrust enforcers signed off on the $54 billion takeover a month later. From that low point in August to the end of November, Express Scripts rose more than 40 percent. At the same time, Gross’s fourth-largest bet at the end of November was a short position in Cigna shares. They increased about 20 percent over the same two months. There’s no way to independently determine exactly how the trade fared, but Global Unconstrained is up 3 percent over the past three months, better than 97 percent of its peers. And yet, the outflows persisted. Perhaps that’s a signal that performance isn’t the only catalyst for withdrawals. Is a bond fund really an appropriate place to bet on one specific, massive acquisition? And is Gross, who has focused on fixed-income and macro investing for decades, the best person to analyze the likelihood of a merger going through? He seems to think so. At this point, that’s basically all that matters. Gross didn’t respond to an emailed request for comment about his stake in the fund and the merger arbitrage trade. In fact, Bloomberg analysis of public holdings data reveals only two other investors in Global Unconstrained. One is Affinity Investment Advisors, which, like Gross, is based in Newport Beach, California. As of Sept. 30, it had 165,809 shares, worth about $1.48 million. The firm has had such a stake since the end of 2015. Steve Spare, director of marketing and business development, didn’t respond to an emailed request for comment on the holdings. The other is the Trust Company of Vermont, which as of Sept. 30 had a position in Class T shares worth about $188,000, Bloomberg data show. It’s no secret that Gross’s personality led to clashes with others, as a 2014 article in The Wall Street Journal reported. It had some commentators even suggesting it was time for him to retire. Since that wasn’t going to happen, it seems only natural that he wound up with a fund that can go anywhere and do anything, unbeholden to just about anyone. Global Unconstrained can’t be viewed like an ordinary fund, however. For the most part, the only person suffering from Gross’s bad decisions is Gross himself. And because of that, he has a lot of leeway to do what he wants. He still employs a negative duration, for one thing, though it’s a much more reasonable minus 1.09 years, compared with minus 3.67 years as of Sept. 30. It’s possible the worst is over for Gross. The fund’s share price is on a modest two-month upswing, which is the first time that’s happened since mid-2017. Maybe the digging-out process has just begun. No matter what happens, though, it’s important to see Global Unconstrained for what it is, put in stark relief by its fall below $1 billion. It’s not so much a bond fund for outside investors anymore. It’s morphed into Gross’s own personal investment vehicle; a way for him to prove he’s still the “Secretariat” of the markets.